TolkienGuide.com - Fake Signature on The Adventures of Tom Bombadil ? 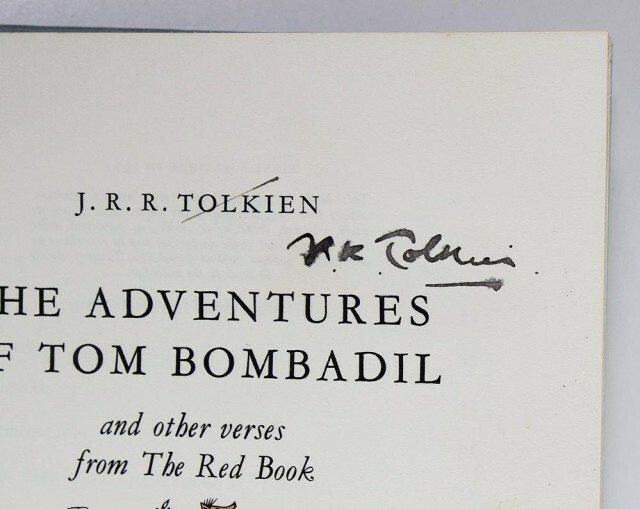 I just came upon this signed volume of the ATB supposedly signed by Tolkien on 21st Aug 1969 in Bournemouth, according a pencil note from the original owner. The signature looks fake to me, but I'm not a specialist. The seller clearly indicates that he isn't sure of it either. What do you think ? That looks like an Allan Formhal's signature to me. Yeah, definitely has a "Higgins" look to it, albeit not in his usual blue ink. He did occasionally use black ink, and he also use to cross out the name when he faking other signatures, looks like he forgot that Tolkien did not do that for this fake. Yeah, I did notice the unusual cross-out. Didn't know AF did that. Thanks for your confirmations, I saw some Formhal's forgeries, but this one was a little bit different, enough to have a doubt.